A school is an institution designed to provide learning spaces and learning environments for the teaching of students (or "pupils") under the direction of teachers. Most countries have systems of formal education, which is commonly compulsory. In these systems, students progress through a series of schools. The names for these schools vary by country (discussed in the Regional section below) but generally include primary school for young children and secondary school for teenagers who have completed primary education. Co-curricular and Extra Curricular activities part of education. students should buy the notebooks, textbooks and records prescribed only by the school. PHYSICS LAB, BIOLOGY LAB, COMPUTER LAB . There is a fleet of school buses plying in a radius of about 15 km. A spacious and hygienic canteen functions for boarders and day scholars. We have around 15,000 books including story books, subject books and reference books. The School is situated in the lap of the neat and clean environs of the Gali no-2 Jagdeo Nager,Arrah, which is some 5 KM away from the town, thus far away from the hustle and bustle and fatal noises of the Capital. At the same time, it is not an isolated place, as it is in the heart of the peaceful colony. Such a locale is a rarity! Radiant public school aim form the academic success and personal happiness of every student. We aim to help each student. #	Leave school having reached the highest academic standard possible. #	Develops their talent and interest which can support a full and useful life. #	Celebrate cultural and social diversity as strength. Transforming Human Minds to enable them to understand the Essence of Life. # Provide a safe, caring and stimulating learning environment. # Maintain high expectations of work and behaviour. # Celebrate success in all areas. Radiant Public School is committed to realizing the futuristic vision of its founders - a society educated to Global standards willing to exercise its refined faculties for the greater common cause. 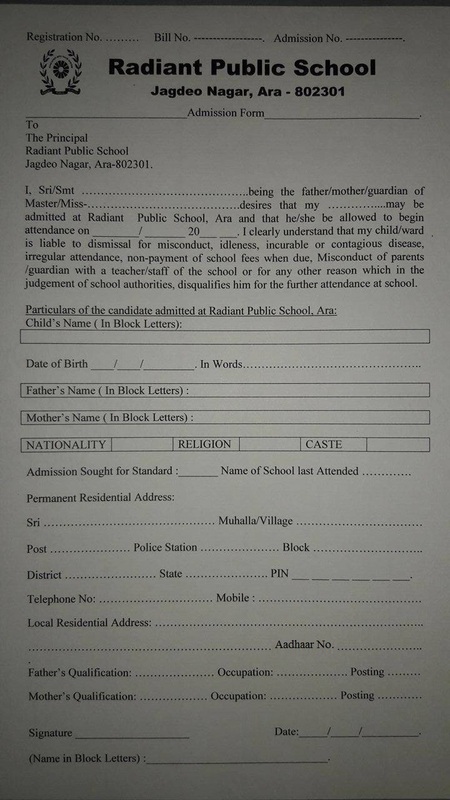 Radiant Public School,CBSE Curriculam English Medium. Run & Managed By- Radiant Educational & Welfare Society (REG).